I just restarted my Mac and wasn't paying attention when I launched the new Photos app. It opened up with the new screen and so I figured, might was well check it out. I knew it was going to grab my existing iPhoto library and convert it, etc, etc, but I wasn't sure how I was going to like it. My first reaction: Meh. Just say no to iCloud Photo Library. My library is well over 100 GB which means I'd need the 200 GB iCloud storage option which would cost $48 to have access to all my photos. Until I ran out of space. And I just switched to shooting in RAW. And now I am using Lightroom for main editing and importing finished photos to iPhoto Photos. Sorry Apple, you need to drop the price here. I'm sticking with Photo Stream until I am forced to change - by using Lightroom, I don't really plan to use the Photos editing features. 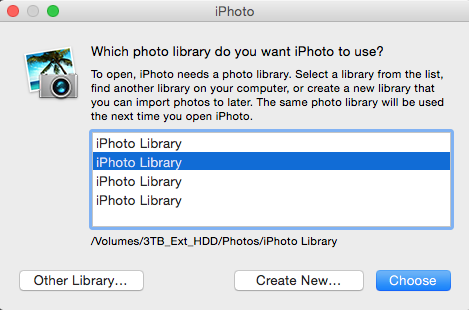 My second reaction: How many bloody iPhoto libraries are now lurking? Then finally: Urg, all my Events are jacked up in this nested album thing. So, how to manage this... It's not too bad, but it will be time consuming. In typical Apple fashion, Photos works differently than iPhoto. First, it seems my default iPhoto library is now "migrated". But, it can still be opened using iPhoto, there is a simple pop up box that informs you what has happened. Go ahead and "Open iPhoto" for the familiar look. 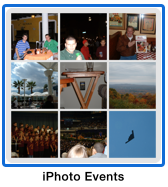 Open up the "iPhoto Events" album, then right click (ctrl + click) on one of the Events. 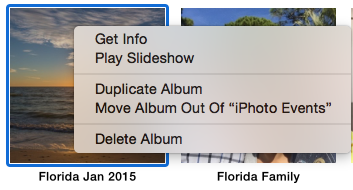 From the menu, there is an option to "Move Album Out Of "iPhoto Events". It works as advertised. Rinse, Repeat. 390 times for me. So, do I like Photos? Yes. It's faster than iPhoto without doubt. The editing options are limited, but good at what they do, straight forward to use, and I expect more features to be added in the coming months/years. However, I can't use it as I hoped as it stands. Had Photos skewed more towards Aperture in capability and iCloud Photo Library was priced at half what it currently it is, I'd use it without reserve. As it stands, I would be willing to spend more time with it if it wasn't for the pricing structure of iCloud Photo Library (the promise of all your pictures anywhere you are is very appealing). Unfortunately, I can see myself surpassing the 200 GB iCloud storage size in the next year especially combined with keeping my iPhone and iPad backups "in the cloud". Remember, the iCloud space you lease has to keep everything, not just photos. This is your device backups, your app data, and anything else that might get stored there now that it is more like Dropbox. For now, I am relegating Photos to be a way to easily share pictures with my family and manage photos and videos that I take with my iPhone or have edited fully in Lightroom from my 5D. When I first started using iPhoto, it was my de facto photo management app. I had a Canon P&S and didn't shot in RAW. Any serious extra editing could be done in external apps as needed. But, with the announcement that Aperture and iPhoto were losing support, and having watched the FCP X fallout, I decided that there was no point in really investing time and effort into the ecosystem. If Photos gains capability as FCP X has, then I'll be able to easily move back to using it with more vigor. For the time being, I'll treat it as a half-way house. I originally purchased my 2011 iMac out of frustration. I had a G5 that was long in the tooth so, purchased a Core2Duo model off eBay that turned out to have graphics tearing issues. I tried to sort it out by getting the BGA re-flowed on the graphics chip which just made it worse. And finally, went out and grabbed a new one. I opted for the i5-2500s with a 500GB HDD and whatever the base RAM was. Since it is a socketed, desktop CPU vs mobile, I knew it could be swapped provided Apple didn't do anything intentionally locking in the CPU model numbers. First step was to upgrade the non-warranty voiding parts - so, I added an SSD (using an OWC kit) and made a Fusion drive while also upgrading the RAM to 16GB (generic Kingston from NewEgg). This saved quite a bit of money vs the Apple build-to-order options. Eventually, the CPU performance was starting to annoy, and after waiting for the AppleCare warranty to expire, I have fully torn down my iMac and am now working with a significantly faster i7-2600s. 1) The i7-3770s will NOT work in a 2011 iMac. I was really disappointed to discover this as it's really just a process change from Sandy Bridge to Ivy Bridge. The biggest reason was simply due to availability of processors. Sandy Bridge prices had gone back up due to limited availability. 2) Fortunately, I had a 2600k laying around the office, so I tried it. And, I can verify that the i7-2600k WILL work in a 2011 iMac. But not perfectly. The issue comes at boot - my iMac would have a kernel panic on the initial boot, but make it through the second time. This made software updates challenging, and some that require a reboot would never install properly. Further, Airplay stopped working with the 2600k. 3) I really don't blame Apple for the continual quest to make computers monolithic, one-use machines. Building or Repairing these machines with their carefully routed cables, delicate connectors, etc takes significant effort and possibly makes QA an utter pain. Going the way of the new Retina MacBook just makes sense from a manufacturing stand-point. 4) The i7-2600s, while not as fast as either the "k" or the Ivy Bridge, works fantastically! All the quirky behavior exhibited with the 2600k is gone, which makes sense, seeing as it was an offered build-to-order model by Apple. Finding the 2600s was fun. I eventually broke down and bought it from a questionable seller as a "Like New" item on Amazon. To be fair, it works great, so the seller was legit! Hopefully, my upgraded iMac will keep me content for another 2-3 years. At this point, Apple has stopped making computers that can be modified in any way by users. My 15" RMBP needed to be purchased exactly as I wanted it since every single component that used to be user-replaceable is now soldered to the board barring the at-the-time unique PCIe SSD. So, I can't go the "cheap" way next time 'round... and it's kind of sad to realize that. Note: OWC has a helpful video to follow and iFixit has lots of pictures to help so that you don't have to pause it every 2 seconds. There is no need to take out the PSU as iFixit shows. I'm not showing the steps since other's have done a great job already.